April was a rare month where we didn't have a SeaSalt order to fill, so we spent the month working on some other orders and also some stock for the shop here at the Leach. 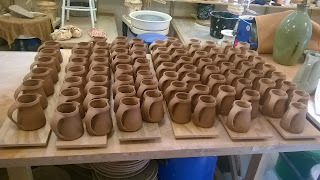 This meant that I got to throw all kinds of different shapes, so I really enjoyed the change of pace. 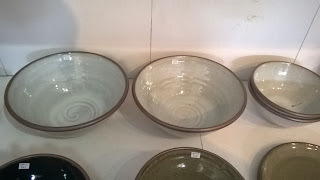 We had a large order of bowls, so I spent a lot of time making bowls of all sizes and nesting pouring bowls. We make these in sets of 3 gradually getting smaller, so it is trick making sure the spout also gets smaller, in proportion to the body of the bowl. We try hard to not make the bowls too round, or they can look as if they have slumped, so the form is more straight then curved. at the Leach. 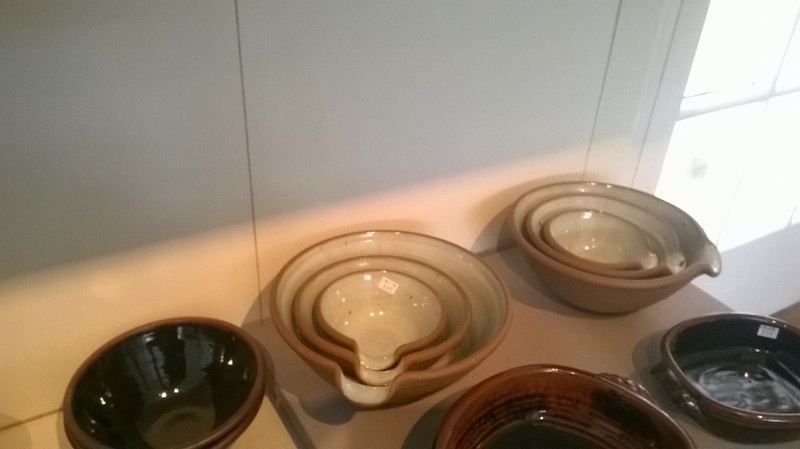 It is nice to see the pots on display after they are finished, rather than shipping them all off! 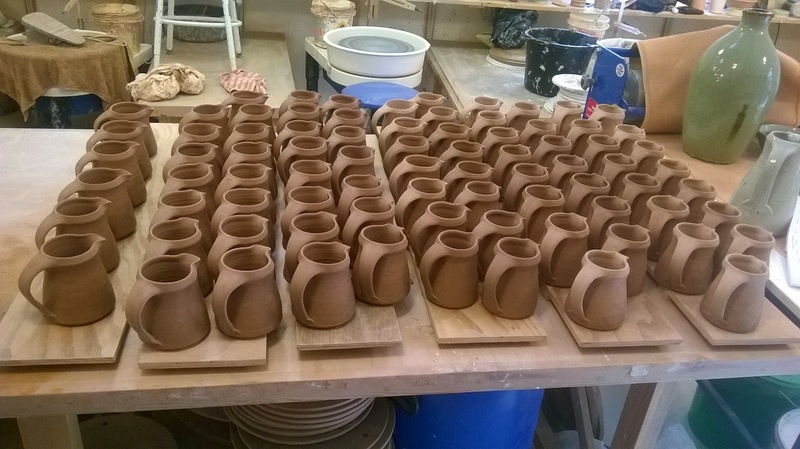 I also spent time working through the different sizes of jug, from creamer to medium jug. 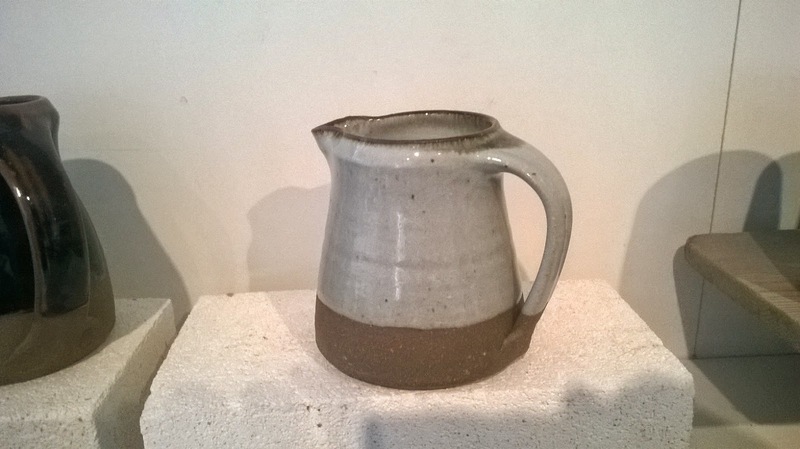 I enjoy making the jugs as there are many different things to think about, including spout, handle etc and how they all work together. This image shows a small jug finished, then below you can see the handle pulling day, with all of the small jugs freshly handled. 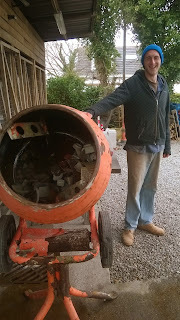 At the beginning of the month we all helped with the beginning of our shard path. We have a shard pile for pieces that have faults or glaze tests etc, which we have begun smoothing down and we will eventually set them in to paving slabs to make a path to Beagle Cross ,the education studio.